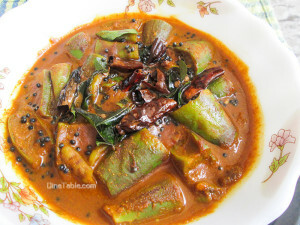 Theeyal is a traditional side dish in Kerala / Onam sadya. It is purely a vegetarian dish. It is also a nice accompaniment with steamed rice. 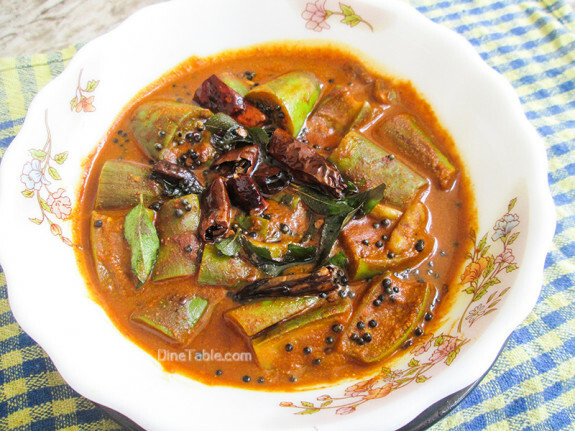 Here I am presenting a tasty and delicious Brinjal Theeyal Recipe / വഴുതനങ്ങ തീയൽ / Brinjal in Roasted Coconut Curry Recipe for this Onam. For making theeyal, we have to roast the coconut along with coriander seeds, dry red chilly, cumin seeds, fenugreek seeds and shallots and grind into paste. This makes the dish different and gives nice aroma and flavor. 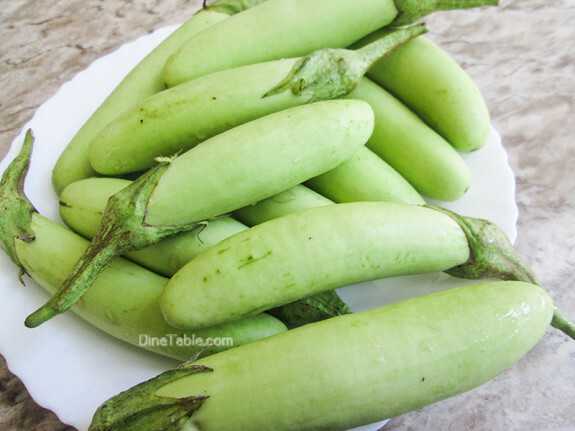 Theeyal can also be made with shallots, lady’s finger or bitter gourd. Click here for other Onam Sadya Recipes..
Heat 2 tbsp of coconut oil in a pan. Add the grated coconut, coriander seeds, dry red chilly, cumin seeds, fenugreek seeds and shallots and fry till dark brown in colour. Keep it aside and let it cool for 2 minutes. Grind this with a little water to a smooth paste. Soak tamarind in 1/4 cup of water. Squeeze the pulp and strain the pulp. Keep aside. Clean and cut the brinjal in to medium size pieces. Heat 2 tbsp of coconut oil in a pan. 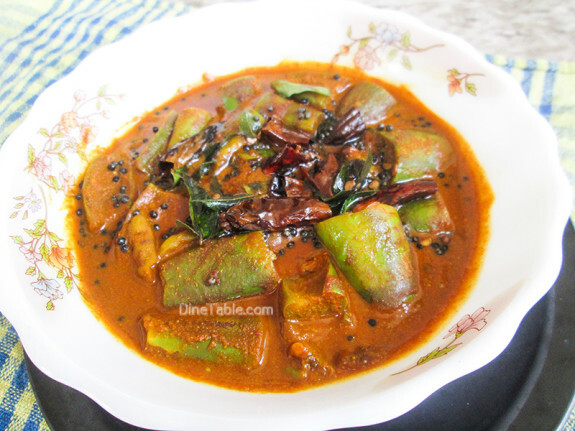 Add the brinjal pieces, green chilly and saute for 5 minutes. Add red chilly powder, turmeric powder and mix well. Add the ground coconut mix, water, salt and tamarind pulp. 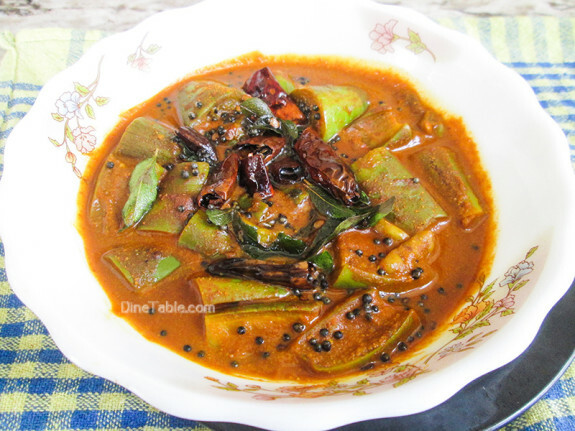 Reduce the flame to low, Cover and cook till the brinjals are cooked. Switch off the flame. Heat 1 tsp of coconut oil in a pan and add mustard seeds for tempering. 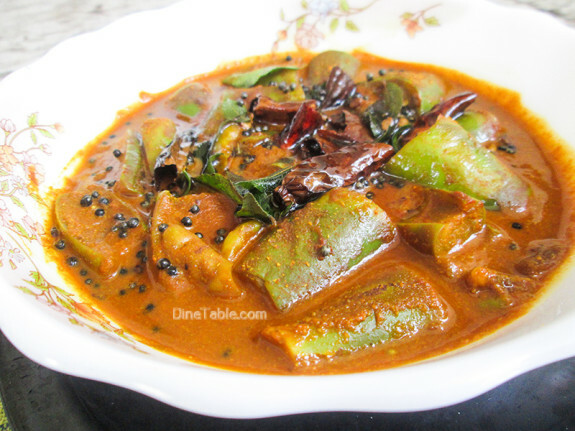 When the mustard seeds start to splutter, add curry leaves, red dry chillies and saute for 2 minutes. Pour this over the theeyal. Tasty Brinjal Theeyal is ready.